Latest update 15.4.2008 / Arto Wikla 22.2.2008. My intabulations try to be honest reproductions of Kircher's staff notation. Also the titles etc. follow the originals. 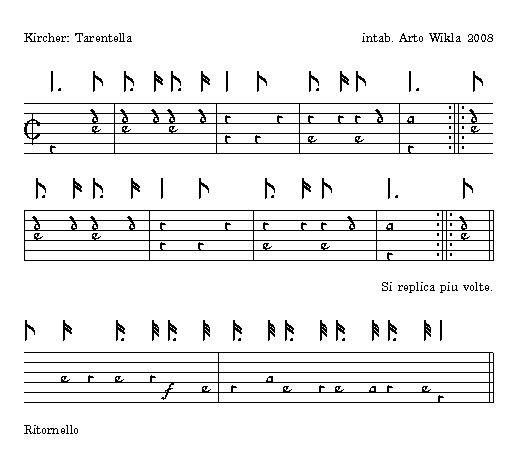 Playing these intabulations by a "renaissance" lute in G will produce the original keys. A 6 course instrument is enough; the 7th course (in F) is needed only once. No harmonizations are are added. The 17th century player(s) naturally played also the continuo, they improvised proper harmonies to the texture of the music. And so it should be done also today! 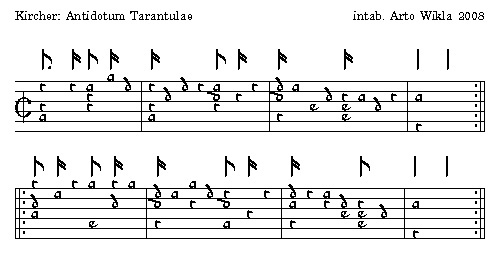 One piece, the Antidotum Tarantulae is an exception among these pieces: it was written in three parts, and when intabulated, it becomes a complete lute piece. Many thanks to Diego Cantalupi for decrypting me the music of this Antidotum! The letter "e" in the bar 3 is not from the notated music, but Kircher gives a continuo "sharp" there. Readers of this page are invited to make their own arrangements! Actually one of Kircher's Tarantelle is not a skeleton, the Antidotum Tarantulae. 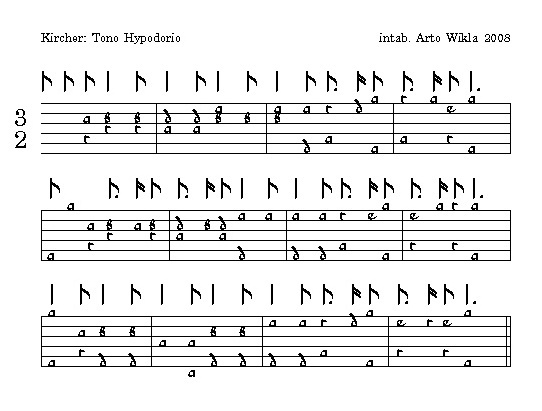 This version is for a lute in renaissance tuning. Six strings is enough. Compared to the version in this page, only some fingerings added. See also my pages French theorbo music / Archlute music / 10-course lute music / Chitarrone music / Chitarrino music. There are also some other arrangements, intabulations, etc. in my Contributions page.